The forehead and brow are often the first areas to show the effects of aging. Wrinkling across the forehead and heaviness in the brows can be caused by many different factors. Stress, sun, wind, the pull of gravity and excessive squinting all affect the face and cause you to look tired and older than you are. To see what a forehead lift can do for your face, put your hands above your brows and outside the edges of your eyes and gently raise the skin upwards. Forehead lifts are an option if you have a heavy brow or deep furrows between the eyes. A forehead and brow lift can be combined with an eyelid surgery or facelift to improve the overall youthful appearance of your face. 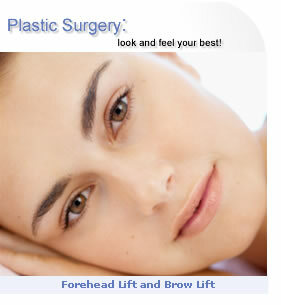 The forehead lift procedure takes between one to two hours to perform. It is most commonly performed under IV sedation or twilight anesthesia. Incisions can be placed at the hairline, behind the hairline, or in some cases, in the brow or in the mid forehead. Your surgeon can help you select the best technique for you. You can expect a certain amount of swelling and bruising in the 10 day period following surgery. Sutures are normally removed 7 to 10 days after surgery. Most patients can resume normal activities in two weeks, but still may be advised to avoid strenuous activities for longer periods. 1. What is a Brow Lift / Forehead lift? 2. When can a Brow Lift / Forehead lift be performed? 3. What is a typical Brow Lift / Forehead lift consultation like? 4. How is a Brow Lift / Forehead lift performed? 5. What should I expect after a Brow Lift /Forehead lift? 6. How long after surgery will the stitches be removed? 7. When will I be able to see the final results from a Brow Lift / Forehead lift? 8. What are the typical risks of a Brow Lift / Forehead lift? A Brow Lift, or Forehead Lift, is a procedure to reduce the angry or tired look of the brows by excising a bit of skin and resituating or lifting the muscles and suturing them higher. A Brow lift is usually performed during the late 20's and upwards. There are endoscopic techniques which do not give a more intensive lift that older patients may need and of course the other techniques, such as the coronal, may be a great option for those who do need extensive lifting. Your surgeon will go over your options that can realistically attain your goals. You will discuss the risks and complications as well as anesthesia choices and fees. As well as what to expect post-operatively. This is the time where you can ask questions regarding your concerns and determine if this surgeon is for you. Do not be afraid to inquire about anything. After you are anesthetized or sedated, your surgeon will determine the area which need to be excised and where the best incision placements would be for your particular needs. You will have this skin dissected and your surgeon will move and suture your muscle or skin, depending. Or he or she may excise or clip your corrugator muscle to prohibit or hinder you from frowning in the future. After the internal work has been done your incisions will be sutured and a pressure dressing will be applied. Expect to be swollen, tender and possibly bruised. This is very normal so do not be alarmed at the presence of any of the above. If you are in pain, take your prescribed medications and do not forget to take your antibiotics and apply your eye salves if instructed. You will be groggy from the anesthetic this is a normal thing, do not fight it. This helps you rest and adjust to your healing period without memory of pain. The results are immediate but you will be swollen, remember to be patient during the healing period and the full results should be visible in a few months. Any numbness along the incisions should subside by 6 months but may remain indefinitely in some patients. Remember that as each day goes on you will be that much closer to your final result, so be patient. There is a chance of hematoma (blood clots), numbness from nerve damage and hyperpigmentation (permanent discolorations) caused by the bruising. There may be asymmetry and/or undesired results resulting from your browlift. Possible infections may arise and scarring can be apparent depending on the incision placement. There can be necrosis of the tissues at the incision lines, resulting in additional tissue removal. If performed by an unskilled surgeon, it is very possible to have your skin pulled too tight and result in a very surprised look. Although you may look this way at first, it should relax.